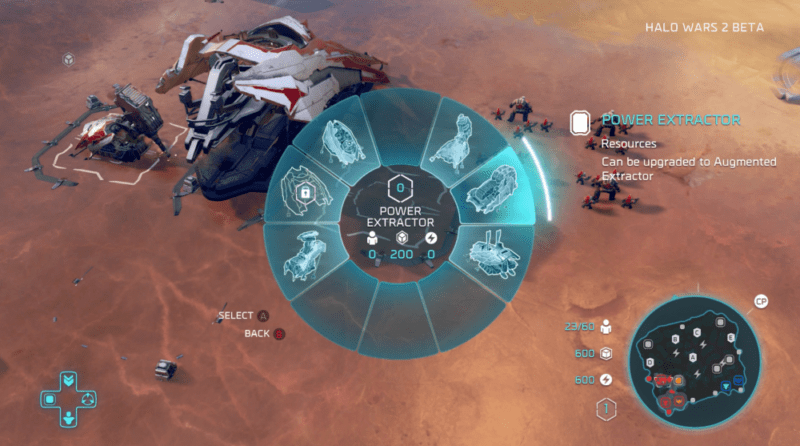 In Halo Wars 2 there are two main resources you want to make sure are always in balance, supply and power. While both are important, the latter is used far more in upgrading buildings and obtaining more powerful units/upgrades down the road. In order to obtain power, you will need to build either a Power Extractor if you’re Covenant or a Generator if you’re human. Both of these buildings produce power and are the only constructible buildings that do so. They also can be upgraded twice in order to increase their energy output, so always make sure to level them up as soon as possible. You can also acquire power by capturing various in-game locations scattered about the map. There are five of these areas in the beta and each one is marked as a big lightning bolt on your mini-map. Just like the capture points, make sure to send a few units over to hold down the area. These can be stolen by your enemies as well, so you want to make sure you aren’t giving your opponent an edge when it comes to resources. Especially since power is fairly slow to build up in the early stages of the game. Power doesn’t increase at the same rate as supplies so you want to make sure that you have more than one Power Extractor/Generator running at any time. We would recommend starting your initial base out with two power creators and add at least one new building per base. The last thing you want in a heated battle is to run out of resources when you need to push out the production of a particularly powerful unit. Manage your resources carefully and you will be on your way to creating some of Halo Wars 2 most powerful units! After all, who doesn’t want one or two Scorpion Tanks.